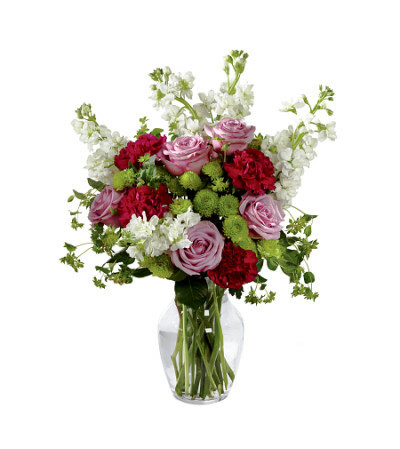 A hug sent from across the miles wrapped in blooming beauty, this fresh flower arrangement conveys your heartfelt emotions with each astonishing bloom. 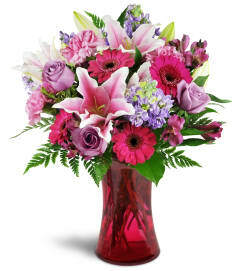 Lavender roses are sweetly stylish surrounded by purple carnations, frilly and fragrant white gilly flower, and green button poms, accented with lush greens and presented in a classic clear glass vase. 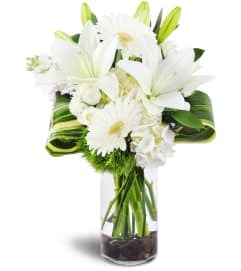 A lovely way to send your warmest wishes in honor of a birthday, anniversary, or simply to say they are always on your mind. DELUXE and PREMIUM varieties are larger and fuller.